Betstars are offering a refund as a free bet of up to £20 if your bet on the Match Result is winning and then loses to a goal that is scored after 80 minutes played. Applies to all Premier League, Champions League and Europa League games. A goal scored at 80:01 would trigger the offer. A goal scored at 80:00 would not. To get the full £20 refund, you need to bet £20 on the win-draw-win (Match Result) market. Open up Betstars and your Exchange and find a close match on the win-draw-win market. 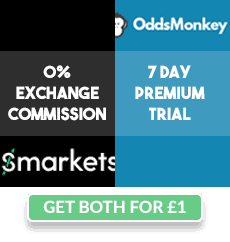 Alternatively you can use Oddsmonkey's Oddsmatcher to filter out Football. A lot of goals are scored late in football so just take the closest match and hope for the best. Bet £20 at odds of 1.5+ on the Match Result. If the odds are extremely close (almost £0.00 loss) then you should bet more than £20 to look more muggy. If your bet is winning and a goal scored in the 80th+ minute turns it into a losing bet, you'll get a £20 free bet refund. Example: Bet £20 on Manchester United at 1.6. If they're winning 1-0 and then concede at 80:32 and the match finishes 1-1, you will receive a £20 free bet. If you've bet on a team they don't necessarily have to lose - a draw would also count as your bet losing and trigger a refund. Free bets expire 7 days after being credited. As always try to find a close match between the back and lay odds because this offer doesn't trigger too often. Stay away from games with heavy favourites. Man city playing Yeovil for example; Man city are likely to score lots of goals and the chances of an 80th minute turn around are very slim.